The Agendas for our Open Business Meetings are available for your inspection and perusal. These publications, like most of our Publications, are FREE, but we welcome donations, both in funds and in kind, for our nonprofit mission, also with the option of tax-deduction for your Donations. And now, here is the plan for 2018 at the International Congress on Medieval Studies. We announce the Programs for our Sessions, describe their aims and scope, and outline our other Events. 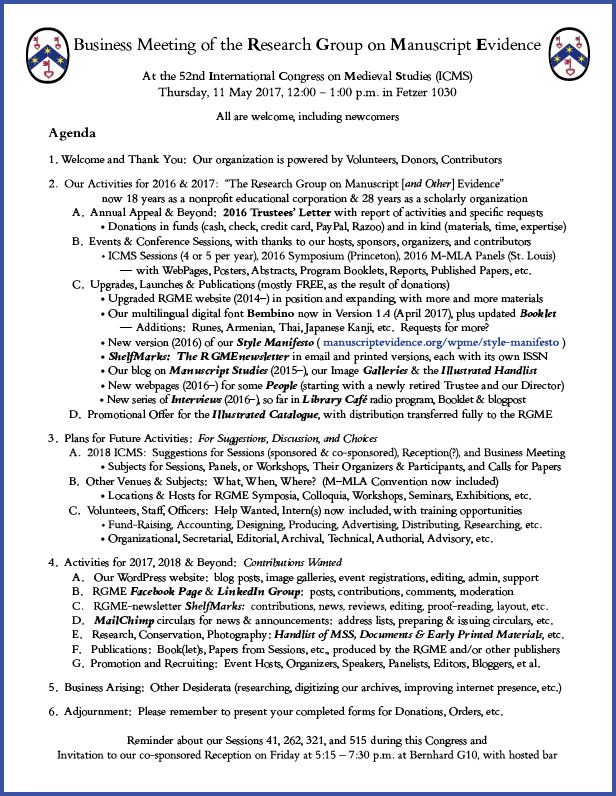 Customarily, we publish the Abstracts for the Papers and Responses, if the Authors wish. Friday 11 May at 10:00 – 11:30 a.m.
How have transmission processes affected texts (and vice versa)? 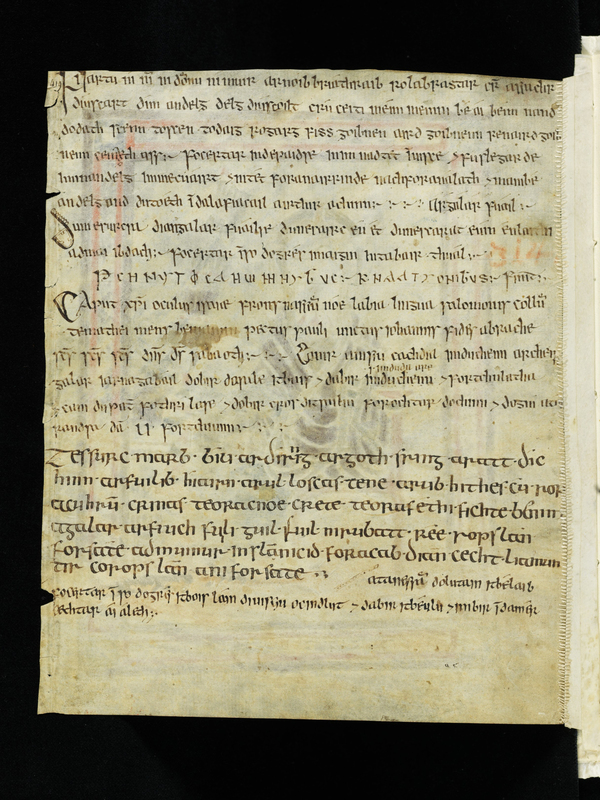 How have the actions of readers and scribes contributed to the form in which manuscripts are currently preserved? 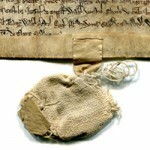 How are the history of ideas and texts related, as attested by extant manuscripts from the Middle Ages? 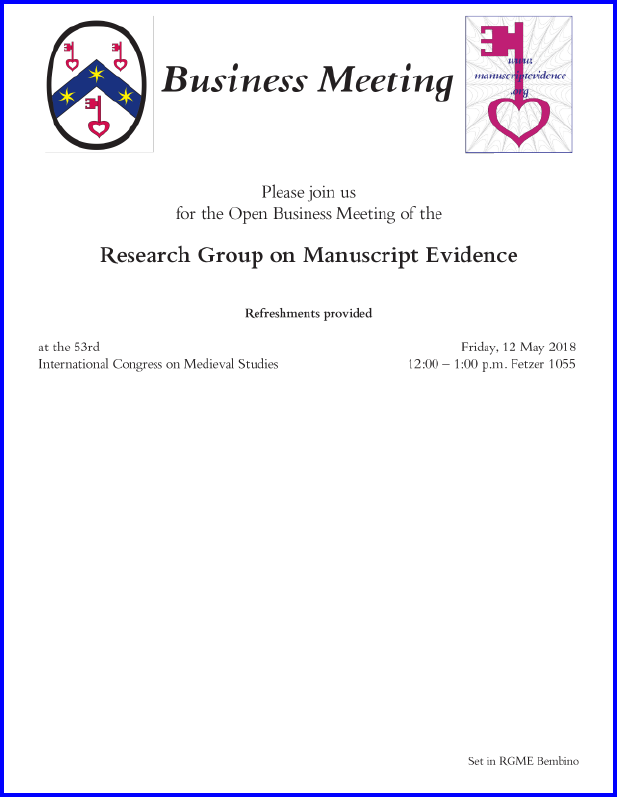 The session aims to provide a clearer understanding of the processes through which texts have been transmitted and preserved through and within manuscripts, resulting in a more dynamic conception of how material texts interact with the world. Examples might offer new discoveries and applicable methodologies. Paris, BnF, MS latin 17987, folio 46 recto. 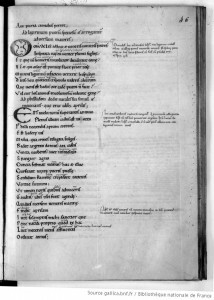 Horaces ‘Odes’ (Carmina), Book IV.10-11 with commentary. Via gallica.bnf through Creative Commons. Paris, BnF, MS latin 17987, first opening with front endleaf and folio 1 recto. 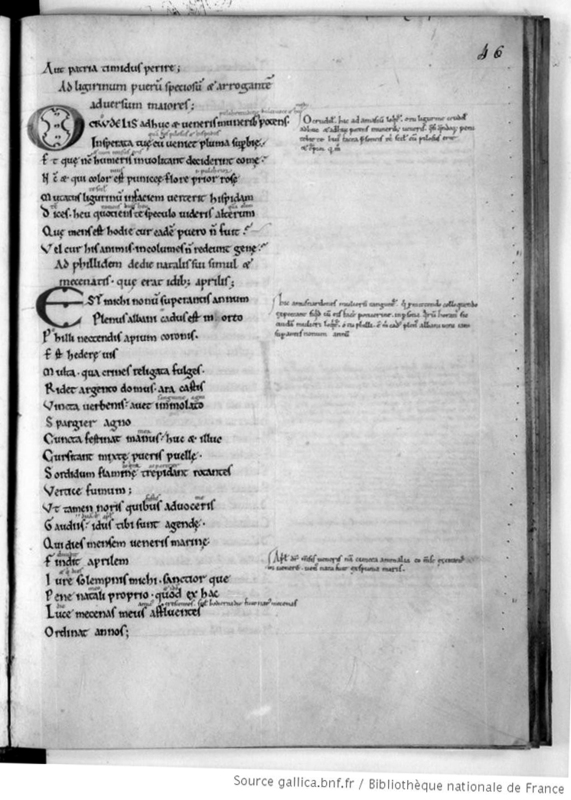 Ownership marks and first page of Horace’s ‘Carmina’, with commentary. Via gallica.bnf through Creative Commons. 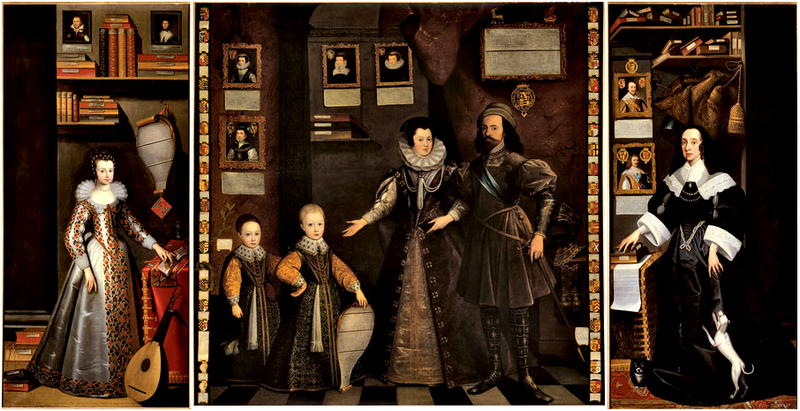 ‘The Great Picture’, commissioned in 1646 by Lady Anne Clifford, 14th Baroness de Clifford, Countess Dowager of Dorset, Pembroke and Montgomery (1590-1676). Kendal, Cumbria, Abbot Hall Art Gallery, Kendal. Image in the Public Domain, via Wikipedia Commons. Friday 11 May at 3:30 – 5:00 p.m.
Libro de los juegos. 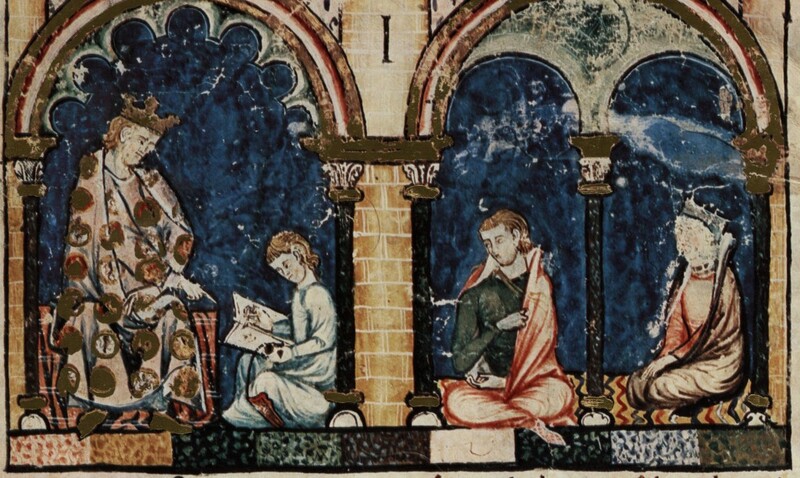 Madrid, Real Biblioteca del Monasterio de El Escorial, folio 1 recto, detail. Alfonso X, “the Wise,” of Castile was a polymath himself, and sponsored many more across the various communities of Iberia. His court was the political center of Castile, at least until the rethinking of law and politics he promulgated in the Siete Partidas combined with his (invited) Ghibelline bid for the Holy Roman Emperorship to provoke a civil war in his realms, led by his second son Sancho IV. 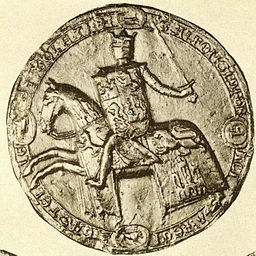 Seal of Alfonso X of Castile. As reproduced by Otto Posse (1847-1921) [Public domain], via Wikimedia Commons. Iberia was also a crossroads of travelers – scholars, pilgrims, diplomats, merchants — from all over the world, with destinations like the courts of Castile and of the Crown of Aragon. 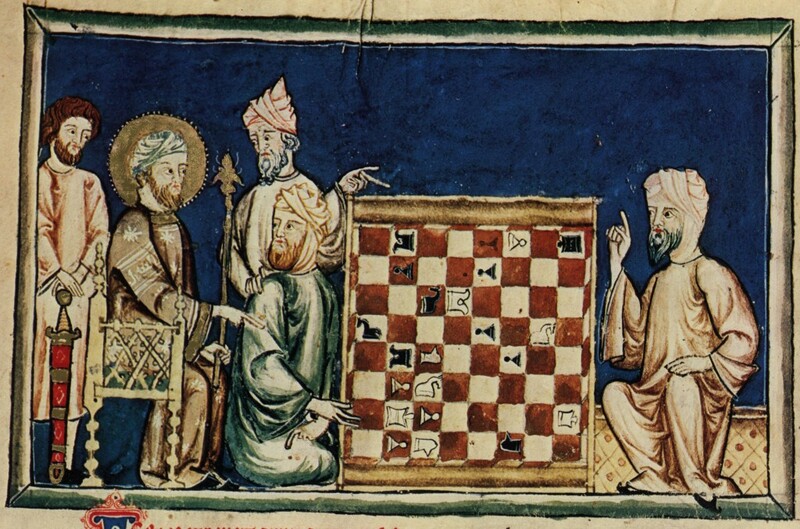 Among the vast corpus of works which Alfonso X either directly or indirectly composed, his book on games and gaming, the Libros de ajedrez, dados y tablas (also known as the Libro de los juegos), likely finished in the early to mid-1280s at the end of his life, seems to have reflected these intellectual and political dynamics, and recorded many such travelers and dwellers of his court. In spite of a facsimile from the late 1980s (ISBN 84-85935-28-4), this book has until recently garnered very little attention, particularly attention that considered it beyond the domains of chess and gaming, and art history. With Sonja Musser Golladay’s 2007 dissertation and Olivia Remie Constable’s article of the same year, however, and more recent studies, analysis of the book and its context have begun to contribute to our understanding of many other aspects of the 13th century, due to its incredibly rich representation of layers of information, ranging from the portraits in its miniatures to the intertextual networks of translation in multiple domains. In this era of “big data” and datamining, the Libro de los juegos offers a significant counter-case: one specific manuscript of only moderate length that provides insight into a multiple domains. It is “small data,” but data so rich that it produces “big results” when placed in productive tension across domains and disciplines. It is a book that lends itself to interdisciplinary conversation, and to conversations that trace its contents and its effects over time, as part of a particular corpus and part of a concrete library. The purpose of this session is to encourage a lively interdisciplinary discussion of its texts, images, and the physical book from a variety of domains, perspectives, and methods in order to address a broad array of questions both related to and beyond its explicit topic, games and aristocratic leisure, and, as such, welcomes participants from all quarters interested in cross-disciplinary analysis and discussion of the Libro de los juegos. Libro de los juegos. 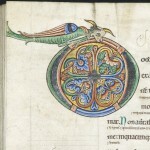 Madrid, Real Biblioteca del Monasterio de El Escorial, MS T.1.6, folio 17 verso, detail. Thursday 10 May at 3:30 – 5:00 p.m. The medieval Insular Celtic cultures — particularly those of Ireland and Wales — have a variety of magical texts which survive, but often in literally marginal locations in manuscripts, or embedded within narratives and other literary contexts. While these are receiving increasing attention amongst the specialist audience of Insular Celticists, they are sadly unknown and relatively inaccessible to the wider academic attention of scholars of magic, as well as medieval academia generally. 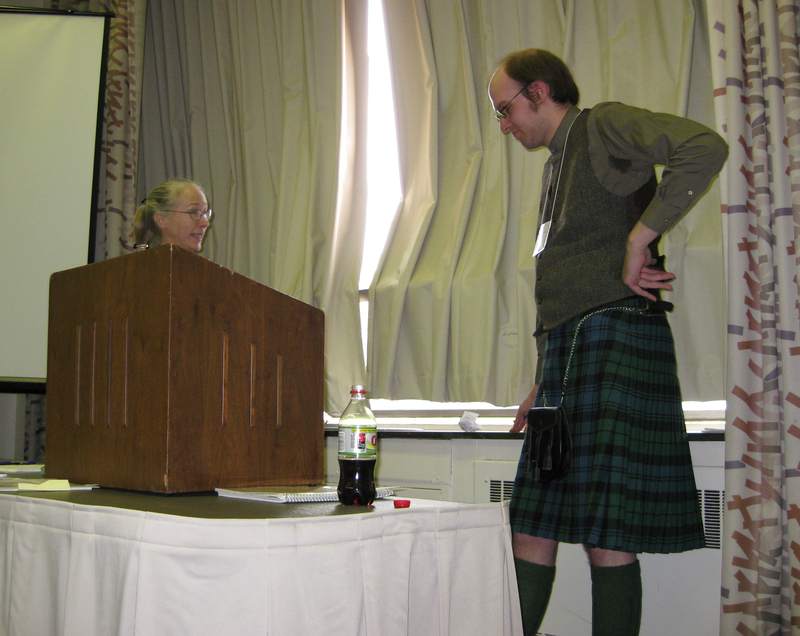 This session will feature the work of established and emerging scholars who are working on these primary sources and the issues raised by them, including how each of these cultures defines “magic,” specific issues in textual editing in the respective Insular Celtic languages, and particular themes and patterns observable in the content of these magical texts. You may glimpse the “Saint Gall Incantations” here, on the verso of a single despoiled leaf (via www.e-codices.unifr.ch/, specifically at page 419). 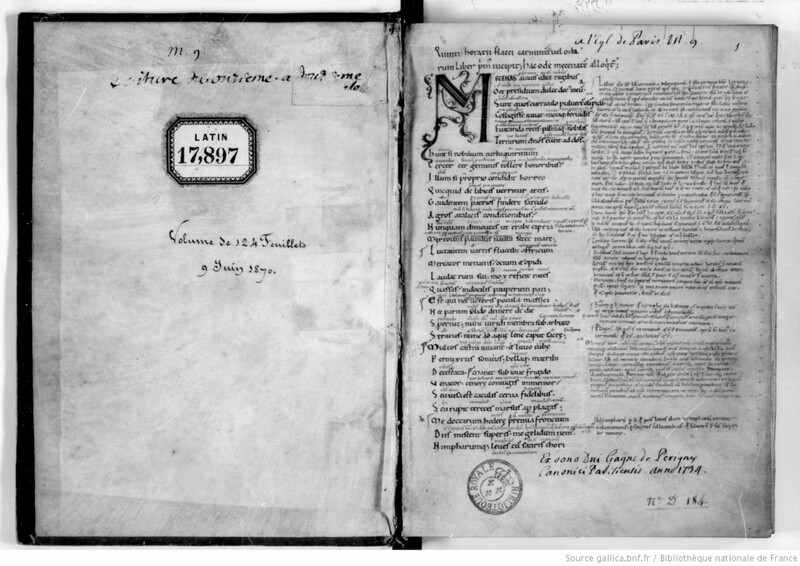 First the recto with an illustration of the Evangelist Matthew as a scribal author, then the verso with the charms in Old Irish, presumably added to an originally blank page on the back of the illustration, offering an available space for the record. Saint Gall, Stiftsbibliothek, Cod. Sang. 1395, page 418 (https://www.e-codices.ch) = recto with a framed illustration of the scribal evangelist Matthew with his winged symbol, a Man. Via Creative Commons. 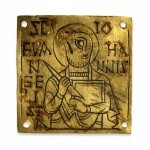 Saint Gall, Stiftsbibliothek, Cod. Sang. 1395, page 419 (https://www.e-codices.ch) = verso with the Saint Gall Incantations. Via Creative Commons. Saturday 12 May at 1:30 – 3:00 p.m. The Picatrix, as is well known, was without question historically the most popular of all Arabic occult-scientific manuals—but only in Latin Europe. The first session of this pair will focus on the Picatrix at the intersection of the Latin and Arabic worlds, featuring new research based on a forthcoming new critical edition of the latter and a new scholarly translation with commentary on the former. Saturday 12 May at 3:30 – 5:00 p.m. While the original Picatrix — in Arabic the Goal of the Sage (Ghāyat al-ḥakīm or غاية الحكيم) — was certainly long prized in the Islamicate world as well, however, other Arabic and Persian manuals came to far outstrip it in popularity and influence from the 12th century onward, and circulated over geographical areas equally vast. Due to persistent Eurocentrism, these occult blockbusters of the Islamicate world remain virtually unknown to the scholarship on medieval and early modern Western (Islamo-Judeo-Christianate) occultism. To help rectify this gross imbalance, the second session presents four Islamicate occult-scientific manuals, three in Arabic and one in Persian, that too enjoyed blockbuster status over centuries. 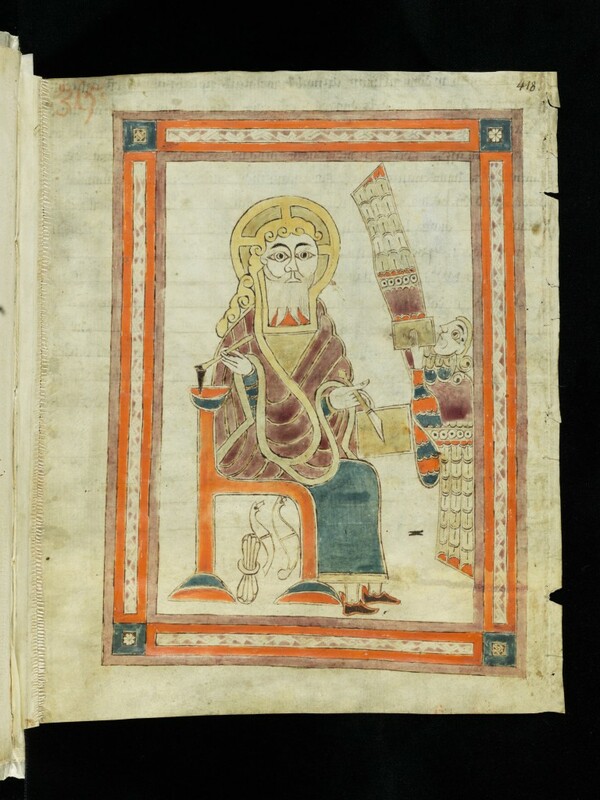 Note: Glimpses online of Arabic manuscripts of the Picatrix appear, for example, here. This session is announced also, for example, here. Thursday 10 May 2018 at 12:00 – 1:00 p.m. Through a donation, Lunch will be provided. All are welcome. The Agendas for our Open Business Meetings are available for your inspection and perusal. They outline our activities, aims, requests, and possibilities, with invitations for suggestions and contributions. 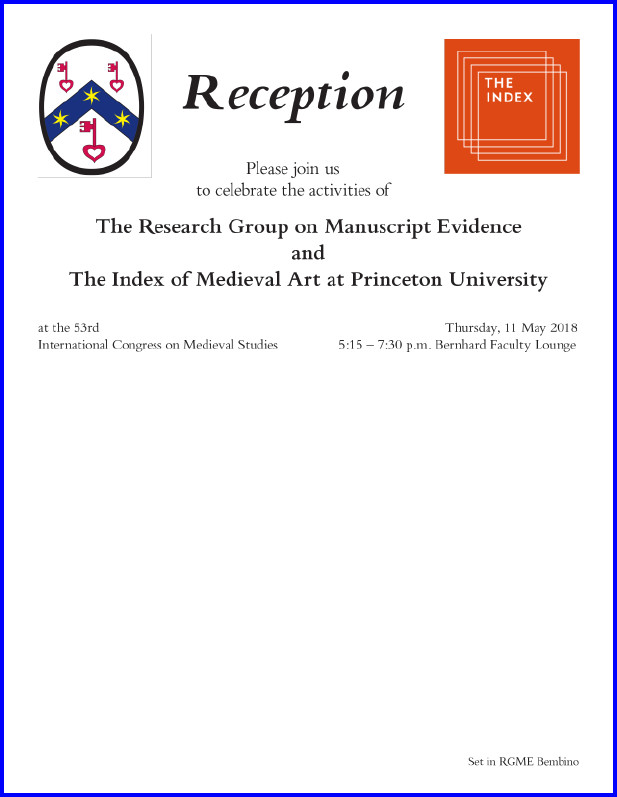 Thursday 10 May 2018 at 5:15 – 7:15 p.m.
As in recent years, the Reception is co-sponsored with The Index of Medieval Art at Princeton University. This Reception has an Open Bar (not a Cash Bar). All are welcome. For our nonprofit educational mission, with tax-exempt status, Donations in Funds and in Kind (expertise, materials, time) are welcome. Please Contact Us with your questions, suggestions, and offers to help our mission and activities.